Kiryas Joel, NY - Just days after New York State narrowly made its annual fiscal deadline, approving a $168 billion budget that included modifications acknowledging the academic standards of the yeshiva system, the Satmar Rebbe Rabbi Aaron Teitelbaum lauded Senator Simcha Felder for his diligent efforts on behalf of yeshiva children statewide. The Satmar Rebbe praised the education provided by yeshivas, noting that while this unnamed group has spent years convincing elected officials from NYC to Albany, that yeshivas offer students sub-par schooling, leaving them ignorant and ill-equipped to deal with life, nothing could be farther from the truth. Local law enforcement can verify the low crime rate in Charedi communities, said the Satmar Rebbe, which have few of the problems that plague the secular world with its supposedly superior education. Hoping to avoid the aforementioned group’s agenda of mandating greater government oversight on yeshiva curricula that could require schools to teach topics that run contrary to Orthodox Judaism, something he described as catastrophic, the Satmar Rebbe reached out to numerous individuals several months ago including Felder, who represents Borough Park and large parts of Flatbush in what was dubbed the “Super Jewish District” when it was created several years ago. A Democrat who caucuses with the Republicans, giving them the majority in the Senate, Felder has been staunchly unapologetic about advocating for his constituents, an extremely large number of whom send their children to Charedi yeshivas, including thousands who are followers of the Satmar Rebbe. The Satmar Rebbe was one of several high ranking religious leaders who were involved in ensuring that New York’s education law would take into account the academic demands of a yeshiva education which includes high level analytical skills taught during a school day whose length is often more than double that of public school. Also stepping into the picture was Governor Andrew Cuomo who called the Satmar Rebbe last Thursday night, urging him to intervene with Felder who refused to back down from requested modifications to the proposed education law in an attempt to pass the stalled budget. Saying that the spiritual well being and religious freedoms of thousands of Jewish schoolchildren were at stake, the Satmar Rebbe declined the governor’s request. The budget bill that passed the Senate, S. 7509, requires non-profit elementary and middle private schools with dual curricula, whose extended hours meet certain guidelines, to teach literature, writing skills, math, history, social studies, civics and critical thinking skills. Those that do could be considered by the state education commissioner to be meeting the state standard of providing a “substantially equivalent” education. High school students who have graduated from a school providing the aforementioned education, who are in a bilingual program that runs until at least 6 PM on most days and are engaged in an academically rigorous curriculum that develops critical thinking could also be considered to have received an education that is substantially equivalent to that being taught in public schools. Rabbi Chaim Dovid Zwiebel, executive vice president of Agudath Israel of America which advocates strongly for the needs of the Orthodox Jewish community, has also been in contact with numerous individuals, including Felder and the Satmar Rebbe, to protect the educational standards of yeshivas. Rabbi Zwiebel noted that the Satmar Rebbe is the leader of the largest single yeshiva community whose followers would be most impacted by any state laws that attempt to regulate private school education. The movement to defend yeshivas against regulatory oversight was never intended to be a complete exemption from state law that requires private schools to meet mandated educational criteria, explained Rabbi Zwiebel. “We acknowledge that government has the right to ensure that children in all schools, including ours, receive a sound basic education that prepares them to function as productive citizens,” noted Rabbi Zwiebel. “What we take issue with is excessive government regulation or oversight that would require yeshivas to conform to the same curricular requirements as those used in public schools. 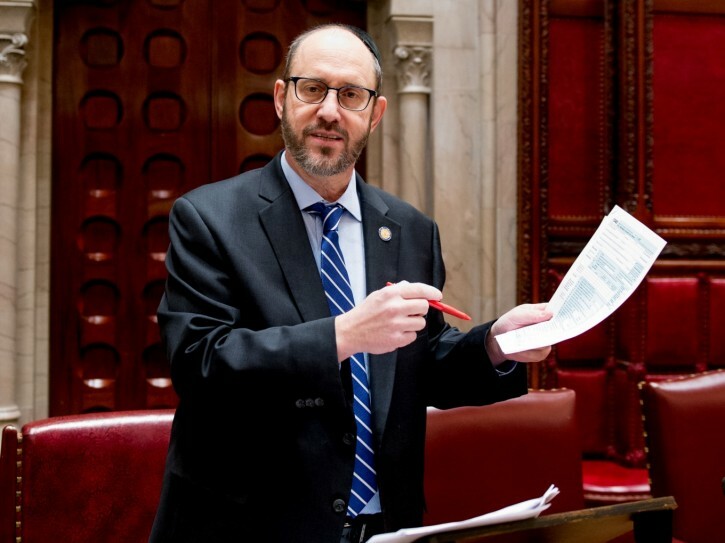 Felder has been hammered mercilessly by the media over the past week, accused of holding the state budget hostage to his demands and introducing legislation that would keep yeshiva children uneducated. For his part, the state senator seems unfazed by his critics and said he hopes to continue advocating for his constituents and their preference to limit government oversight of religious schools. Continuing his remarks to his followers, the Satmar Rebbe said that he was grateful to have been able to play a part in averting an educational catastrophe and that his followers should have extra conviction when they say Hallel on Pesach to thank G-d for the positive results achieved. 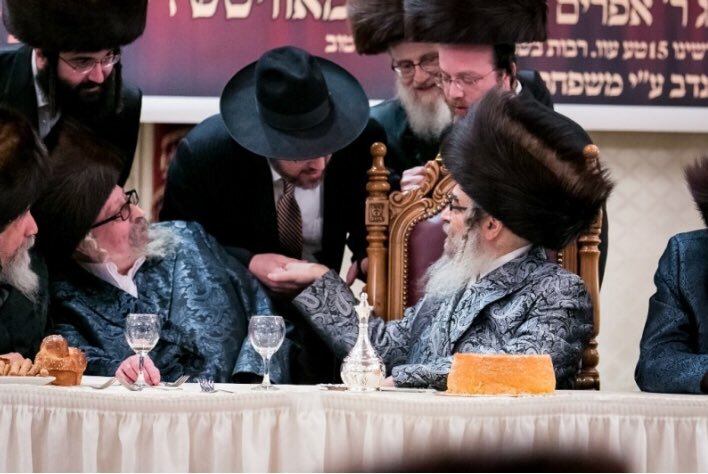 The Satmar Rebbe spent several minutes praising Felder, showering him and his family with blessings, calling him a savior for more than 100,000 Jewish children who live in New York State. Aguda and Satmar on one side and logic on the other, gee this is an easy side to see who is wrong. I might add that Simcha Felder was once a finance professor at touro college. He should know how important education in the first 18 years of your life is important. Felder did an awesome job in having a hand saving the community. Credit should also be given to ALL real Askonim (activists) who worked tirelessly on behalf of the community without any agendas or SELF INTERESTS. To those individuals who really mean to do good as senator Felder. Not ONE rebbe or Rav worked on this issue. Numerous worked hard and still do without proclaiming " I" did this and "i"did that. "I" "I" and "I". These low life's who are taunting the community as if we are uneducated behave like the lowest. They are harassing, taunting and defaming every single politician who wont listen to them. We cant ignore them but we should not be scared of them. They are nothing but lowlifes and highly illiterate unsuccessful blaming everything on everyone. My bro Munch says the Satmar Rebbe was niftar quite a while ago, leaving no son worthy of succeeding him. Here is the big question that I have still not received a response for. We agree that govt regulation of yeshiva's education is dangerous. They can force yeshivas to teach LGBT education etc... So a no govt regulation policy is vital. But why don't schools teach a kosher secular edcuation that's vetted by frum ehriclha staff? What's wrong with teaching secular education in a kosher manner? I have yet to see why not?? Is it bitul torah? (are 9th graders really learning in that time) What's hashkofically wrong with it? And this is also not a debate on how much employment it brings. I am simply asking why not teach 9th grade males whats taught to 9th grade females? What's the difference? why not? why? All you need for Touro is a GED which you can daven up in two months. Yasher koach Reb Simcha - you've ensured that generations of our people will remain FRUM - Food stamps, Relief, Unemployment compensation, Medicaid! “ These low life's who are taunting the community as if we are uneducated behave like the lowest. They are harassing, taunting and defaming every single politician who wont listen to them. We cant ignore them but we should not be scared of them. The poor spelling in your comment is an illustration of the fact that children are not receiving an adequate education. "My child, my choice" schmeckt fin "My body, my choice". “ Here is the big question that I have still not received a response for. I’m not really sure why you think 9th graders don’t learn in that time. When I was in 9th grade we learned for nine hours a day. Add in time for mikvah, tefillos, meals, and a little bit of time for breaks, and our day was over 14 hours long. When would we have had time for secular studies? I am pro education however your critique re poor spelling is antiquated. Nowadays, with spell check and grammar check its less needed. Most of my business correspondence is via e-mail. My supervisors prefer text like short one sentence e-mails to well written emails. As long as the numbers work my supervisors are content. PS sorry I don't use spell check for VIN. Has anyone ever heard of the story of the shammias in the pickle factory? I am just waiting for all the comments re how rich one can be w/o a degree. It reminds me of that story. The goysha version of it is entitled "the verger"
You really had zits fliesh to learn torah for 9 hours? Simcha, who is a real mentsch, was not advocating that our children be uneducated but rather that government should not intrude into our yeshivos. That organization that called for an investigation got the opposite of the result they wanted. Parents are free to choose the level of education that they want for their children from hundreds of yeshivos without government intrusion. Sorry to burst ur bubble. Hes not a successor of the “Bal diveei Yoel”. His father barely was. The holy Rebbe did not leave any succesor due to the obvious. I believe that people, including children, should be allowed to choose education for themselves. Why should parents get to choose more than the children themselves? It's the children's lives, not theirs. Parents get too much credit. Any two idiots can pop out a baby. from a kefiradik out look your right.. from a torah haskafa your wrong. the netziv closed the yshivah as not to be under chukas hagoy. If you don't want government to "intrude into our yeshivos" than you shouldn't receive government money. OK fair enough but then don't dare ask the govt for a dime. If satmar wants no govt intrusion then they need to survive like in Israel without taking any money from the medina. No school lunch programs,title 1, busing , security or any other perks they get from the govt should be allowed. “ Felder did an awesome job in having a hand saving the community. That's a myth preparatrated by Brisk and the yeshiva system. The netziv's yeshiva did in fact cave in and offer a secular education. It was only when the govt said that they needed to teach secular studies full time and only learn at night, that the issue arose. And there was also politics including a din torah with the Mir. Read up on the true history of voluzhin. That's a dangerous arguement. HS kids are babies and have no sechel. You can't really expect them to make smart choices. So anyone on government assistance can be forced to do what the government wants them to? No, but they can be given the choice to either do what the government wants or get off programs. shoite, so if govt decides that pork is very healthy and should be part of lunch program we should eat it,heh? You are rationalizing. I work in Rockland and see the quality of education these students get all the time. They can't spell the street that they live on or the town which they reside. It's pathetic. Keep rationalizing that's your only defense. I have seen you raise this question before and it is an excellent one. However, in my opinion the answer is rather complex, and I don't know if I could do it justice due to the 1200 character limitation. In the first half of the 20th century, the secular environment was relatively benign, and the danger of exposing our youth to its influences were rather insignificant. What could we fear, that a child would visit a neighbor to watch a baseball game on TV? Big deal. Therefore, the advantages of providing a basic secular education far outweighed the risks. would be giving the children access to world values that are antithetical to our own. Even listening to a radio station can be a corruptive influence. It is therefore the decison of the parents, not the yeshiva faculity, to defer secular education until the child is mature enough to handle the disparity. There is plenty of time to play "catch up". Let me stress that I personally do not concur with the above for reasons that are too lengthy to discuss here. Nonetheless, I believe that the argument can be made in favor of the current yeshiva system. “ That's a myth preparatrated by Brisk and the yeshiva system. what makes you, mr nivel peh, think that the children are not idiots?and what is a goyishe idot kop doing here? ALTERG4, Mr. Moster does, in fact, have a degree and managed to build an organization that is gaining more and more power and influence by the day. He is not trying to blame others, he is trying to help students who would thrive with the extra arithmetic and language knowledge. What is wrong with allowing the boys to receive the same level of secular education as the girls do? And by the way, it's *college* not collage.